Spin Transfer Technologies (STT) claims they've achieved a breakthrough that could significantly improve the specifications of MRAM. The characteristics of this new type of MRAM could make it a good alternative to SRAM when it comes to CPU cache. The main benefit of MRAM over SRAM is that it's up to 4-5x as dense, meaning you can cram more memory amount into the same space. Historically, MRAM has offered excellent performance, data retention, and endurance. The problem was MRAM couldn't deliver all three at the same time. 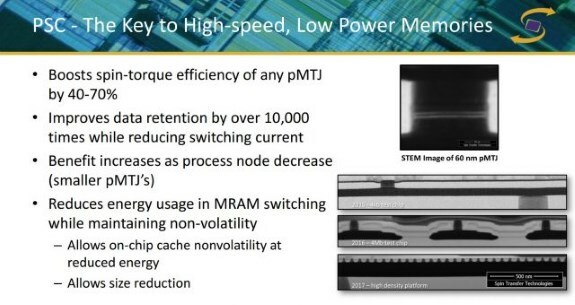 The new breakthrough improves the spin-torque efficiency of MRAM by 40-70 percent, promises retention times that are up to 10,000x higher, and reduces the write current. ExtremeTech has a nice writeup over here. So how does this potentially impact the design of future processors? One advantage of MRAM is that you can cram 4x-5x as much MRAM into the same space as an equivalent amount of SRAM. While the performance characteristics of MRAM aren’t quite as favorable as SRAM, we’ve already seen interest in specific markets for alternative memory technologies, as witnessed by the use of NAND flash as server RAM. There are scenarios in which a larger, but very slightly slower, cache could be far more effective than the current systems we use today, particularly for applications which aren’t particularly latency sensitive. A large on-die MRAM cache might serve as a useful way to improve integrated graphics performance without blowing power curves or die size, for example. STT aims to bring a product to market by mid-2019. It will be interesting to see if this sees interest from AMD or Intel.